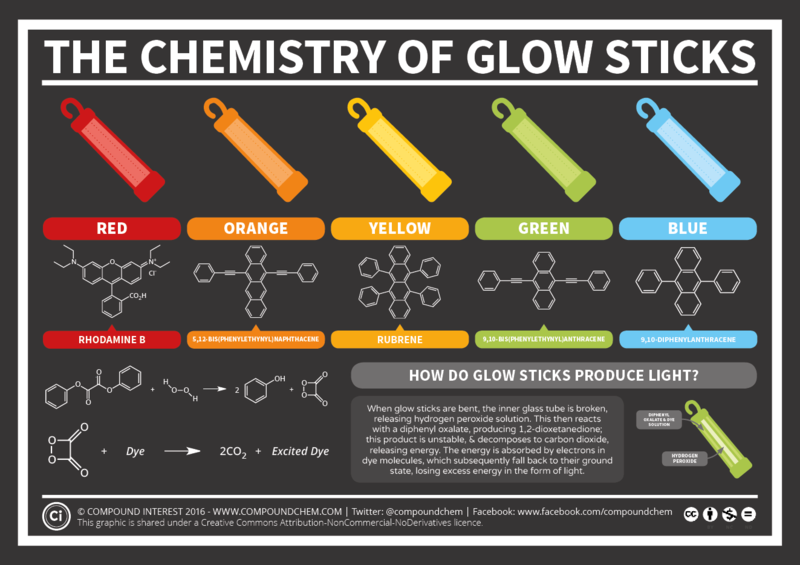 I knew the basics about how glowsticks work, but I wasn’t aware of the actual chemicals involved. But the boy came home with Science homework yesterday evening which was to research the exact mechanism. We never got to play with glowsticks in our Science classes. Although I did use them extensively in farmers’ barns across Northumberland and several (or more) warehouses in Gateshead a couple of years later. My insatiable lust for pointless knowledge led me to peek over his shoulder as he found this rather cool page on this rather cool site. diphenyl oxalate + hydrogen peroxide = phenol (yikes!) + 1,2-dioxetanedione. The unstable 1,2-dioxetanedione then breaks down in the presence of the dye, which is activated by the energy released as two carbon dioxide molecules are produced. Still slightly concerned about that phenol though. Those dye molecules look like something out of the Power Rangers. Of course, you don’t need to know this to enjoy waving your glowstick around, but a little trivia never hurt anyone. Well, unless it pushes something important out of your brain, like how to breathe or something like that. Or just how dangerous phenol can be. So it seems that Cape Town mayor Patricia de Lille didn’t go for my amazing plan which would have solved Cape Town’s water worries for the next 25,000 years. Who on earth knows why, but never mind. I’m not about to give up just yet. Using some of the science from that post, but leaving the chunk of ice the size of Wales out of the equation, I’ve come up with another idea. Obviously, this one won’t help us out for quite as long as the whole 25,000 years thing, but if you’re going to leave a chunk of ice the size of Wales out of the equation, there are clearly going to have to be a few compromises made. We’ve all popped a bottle of wine or a can of beer into the freezer to get it chilled quickly, and then forgotten about it. The result is both upsetting and messy – wasted beverage, exploded glass, split can, sticky freezer. That happens because the major constituent in both wine and beer is (sadly) water. And chemistry tells us that water increases in volume by 9.05% when it’s frozen, whereas bottles and cans just… don’t. Oops. That increase in volume is key to my plan though. The Cape dams are short of water volume at the moment – that’s literally the issue which is concerning us all going into the summer – so why not freeze all the water that’s in there, and get us an extra 9.05% of volume straight away? I’ve been doing some rudimentary calculations, and I’ve worked out that with the current liquid volume of stored water standing at 324,455Ml, freezing it all would give us an extra 29,363,177,500 litres in solid volume. Best bit – we don’t even have to destroy Franschhoek like we were going to do with the iceberg – this extra icy volume will easily fit within our existing dams. It’s certainly not 25,000 years worth of water, but equally, it’s not to be sniffed at either. I’m going to pop into the CBD this afternoon and present this plan to Ms de Lille. This is neither rocket science, nor brain surgery. In fact, my biggest issue is which music to do my presentation to: I wondered about Ice, Ice Baby, but I think that Pump Up The Volume suits it better. If Patricia wasn’t willing to listen before maybe she will now. I can’t be reasonably expected to keep coming up with plans of this level of genius forever. Before you dive down my throat, that’s the way it’s spelled in the title of this Ludovico Einaudi offering. You and I would spell it Petrichor, wiv an aitch. Petrichor is the earthy scent produced when rain falls on dry soil. The word is constructed from Greek petra, meaning “stone”, and ichor, the fluid that flows in the veins of the gods in Greek mythology. Petrichor happens (exists?) as the result of a two separate chemical processes triggered by the rain. Firstly, oils – palmitic acid and stearic acid – secreted by during dry periods, and when it rains, these oils are released into the air. The second reaction that creates petrichor occurs when a chemical called geosmin (you may remember it from such post as Safe To Drink) produced by soil-dwelling bacteria called Actinomycetes is released. Geosmin and these plant oils combine to create the pleasant petrichor scent when rain hits the ground. Actinos – great to look at under a microscope, absolute bastards to grow in the lab. Add to those two the “pre-rain” ozone smell you get ahead of storms and you’ve got the most evocative odour outside of cut grass and freshly baked bread. Night-writing – deserves a quiet night. I’ve been wondering all day whether to share this. Having considered my options carefully, I can’t see the harm in putting it out into the public domain. That sort of realisation will obviously only come to me once I have put it out – irretrievably – into the public domain. So here goes. After two virtually sleepless nights, I gave in and crashed at about 9pm, midway through my prayers to Dave, the God of Sleep. Dave always listens and often answers, usually when I’m lying in bed and after I’ve had a few glasses of red wine. Dave’s like that. And although there were minor disturbances from the offspring, it wasn’t really a bad night. Thus, when my alarm went off this morning, I felt refreshed, revived and re-ady to go. I glanced down at my cellphone, hardly daring to believe that we had got through to 6:30am with only a couple of incidents (albeit that one of them was snot-related and pretty horrific) (I would liken it to an explosion in a lime jelly factory) (but I digress). Not the cellphone – although, of course I did see the cellphone. No, I saw what was on the cellphone. I am growing tired of watching videos of fat girls struggling with chemistry problems. Just like that. In perfect English. On a program that takes four stylus key presses just to open, before you’ve even written anything. Of course, unlike the Samsung Omnia, the Xperia X1 does have a full QWERTY keyboard, which would have facilitated straightforward data entry once the program was open. But even so. I do vaguely recall dreaming about science lessons and an argument with… someone… about some essay or… something… but I couldn’t even tell you if she was a she, let alone whether she was rotund or being filmed. Dream analysts are welcome to analyse away, but I’m a purist and I reckon I was probably just having a dream about some fat chick with limited scientific ability. It means nothing. Probably. Dave works in mysterious ways.